I'm so disappointed. I liked the setting of Metro, I still do, but Metro 2034 didn't live up at all to what [b:Metro 2033|5558786|Metro 2033 (METRO, #1)|Dmitry Glukhovsky|https://d202m5krfqbpi5.cloudfront.net/books/1328809143s/5558786.jpg|5729918] was. 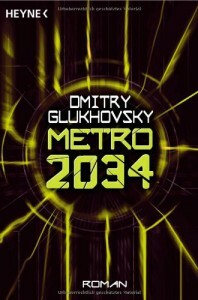 [b:Metro 2033|5558786|Metro 2033 (METRO, #1)|Dmitry Glukhovsky|https://d202m5krfqbpi5.cloudfront.net/books/1328809143s/5558786.jpg|5729918] might have been a bit on the slow side, but this was was super slow. The start of the book was a bit more promising, but as we got further into the book, and more towards the end, it just became a train-wreck. I missed Artyom. I liked to see more of Hunter, though, and he might have been a great MC had it not all turned out so lame. The fact that we never really got into his head was what ruined it, I think, because by the end he just sounded kind of nuts, and I'm sure he was meant to be just a little more profound than that. The setting is still interesting, but there is little told of interest about it anymore. The trek through the stations doesn't hold the same mystery, nor the same sense of impending danger (monsters, humans or otherwise), and there's nothing new to discover. In fact, there's even little old to re-discover, too. Sasha I utterly hated. Boring, whiny, boy-am-i-glad-she-dies-and-hope-she-won't-come-back-in-next-book, and just stupid. Wait, there's an acronym for that: TSTL. Leonid was yet another completely annoying and obnoxious character. The fact that TSTL kept trusting that idiot was just mind boggling. The only time I approved of her 'trust' after all the lies was when she needed to get back to the others, and that was because she had no choice. The story was... wait, was there a story? Hm. So, basically, I could relate with precisely NO character and was hoping half of them would just die already. It really is a pity; I had high expectations on this one, but it failed to deliver up to the standards it had set with 2033. I was hoping for more background, more story, more fantasy - but instead I got a weird romance-ish novel with a lame love triangle that wasn't really a triangle and some nonsense story about a viral outbreak that made little sense. Initially I was going to rate it 3, but I think I'll settle for a 2.